Gregor Samsa wakes up one morning to discover that he has changed into an insect-like creature. Initially determined to make it into work anyway, he gradually accepts his new existence, becoming more bestial as his contact with humans is greatly lessened due to his abhorrent appearance. His family accept the responsibility for his care, but struggle with the burden of his changed presence in their lives. The opening paragraph of The Metamorphosis is one of the most famous of all literary beginnings. I have read it many times in this guise, but have somehow neglected to read the story in its entirety up until now. It’s hard to review a book that can be read in so many ways. 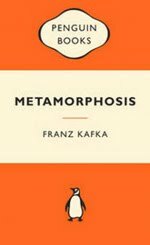 Is The Metamorphosis simply a surreal or fantasy story that provides entertainment on a shallow level? Or is it a complex allegory, commenting on human relationships and the nature of disability and long-term physical or mental illness? The Metamorphosis works brilliantly on either level, which is something that few literary works manage to do. Franz Kafka expertly depicts Gregor’s metamorphosis as a descent into something less than humanity. Gregor’s changes are juxtaposed with the more subtle changes that are experienced by his family members and the reader is left wondering whether it is Gregor or his family who are the true monsters in this story. Kafka’s language (in translation) is elegant and unadorned. His matter-of-fact style and the dry humour that infuses The Metamorphosis lighten what might otherwise have been an overly-depressing read. As it is, the book remains sad in a quiet sort of way, its impact lingering long after the final page is turned. The Metamorphosis is an excellent piece of writing that deserves its reputation as one of the most important works of twentieth century literature.